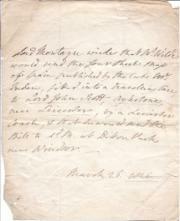 Neither place nor date stated [ c. 1824?]. On two pieces of paper, one roughly 9.5 x 17.5 cm and the other 2.5 x 13.5 cm, laid down on a piece of grey card. 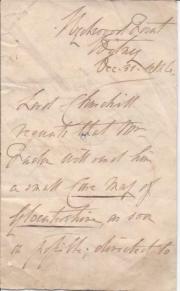 Note on card in a nineteenth-century hand: 'Colonel John Macdonald's writing -'. In fair condition, on aged paper, on good strong card. The notes were apparently intended to accompany a plan, the words 'An Elevation of' being scored through at the beginning of the heading, as is a five-line passage, beginning 'No 1'. 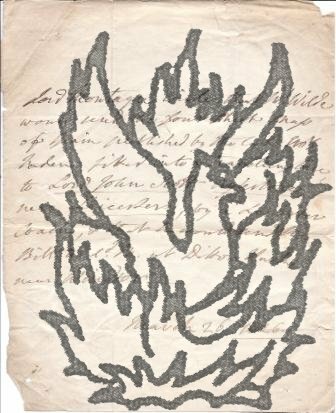 Beneath this deleted passage is a nine-line expanded version of it, beginning: 'No 1 proving insufficient as to strength and light, Mr.
Hand-coloured map of 'The Residency, Palaces, &c. of Lucknow' during the Indian Mutiny, with 'Sketch of the Environs of Lucknow (to the South.) Showing the Route of Sir Colin Campbell's advance', engraved by Edward Weller for the Weekly Dispatch. In portrait on piece of 50 x 35 cm. paper, folded twice. Coloured in blue, brown, green and pink. Image 42.5 x 30.5 cm. Printed beneath image: 'Weekly Dispatch 139, Fleet Str. Day & Son, Lithors. to the Queen. Engraved by Edwd. Weller.' In good condition, lightly-aged with slight creasing to edges and a little wear along fold lines. The plan of the environs of Lucknow is 13.5 x 12.5 cm., in the top right-hand corner. Autograph Letter Signed from Charles Gilpin, Liberal MP for Northampton, to James Wyld, MP for Bodmin, putting the position of the Poor Board in the case of 'Mr Mayall', Relieving Officer. On letterhead of the Poor Board, Whitehall. 31 October 1860. 2pp., 12mo. 25 lines. Fair, on aged paper, with a few ink spots caused by clumsy blotting. He has 'gone through the papers referring to the case' in which Wyld is 'kindly interested', and finds 'that the decision of the Board is in accordance with its uniform rule in similiar cases. | Mr. Mayall received his appointment as Relieving Officer on the express stipulation that he should reside in Bodmin'. Mayall's 'removal would have been objected to by this Board without any adverse representation from Guardians of the District'. 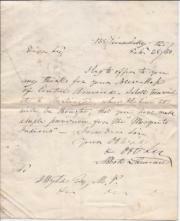 Autograph Letter Signed from Abbott Lawrence, United States Minister to the Court of St James, to James Wyld, Member of Parliament for Bodmin, concerning his gift to the American people of his 'New Map of Central America'. 28 February 1850; 138 Piccadilly, London. 4to, 1 p. Text clear and complete. In original envelope, addressed by Lawrence and with his red wax seal and frank ('Abbott Lawrence'), 'To | James Wyld Esqre M.P. | &c &c &c | Charing Cross East'. On aged and stained paper. He thanks him for his 'New Map of Central America', which he will 'transmit to Washington, where I believe it will be thought, that you have made ample provision for the "Mosquito Indians"'. The following year Wyld would erect his 'Great Globe' in Leicester Square, where it would remain until 1862. Autograph Letter Signed from Slingsby Bethell to the cartographer James Wyld, Member of Parliament for Bodmin, concerning the elevation of his father Richard Bethell, 1st Baron Westbury, to the position of Lord Chancellor. 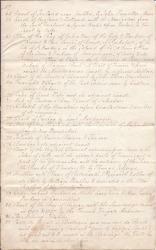 1 July 1861; 2 Upper Hyde Park Gardens (on letterhead of the House of Lords). 12mo, 1 p. Fair, on lightly-aged paper, with pinholes in corners from mounting. Expressing thanks, on behalf of his father, for Wyld's 'kind letter of congratulation to him on his Elevation to the Woolsack'. 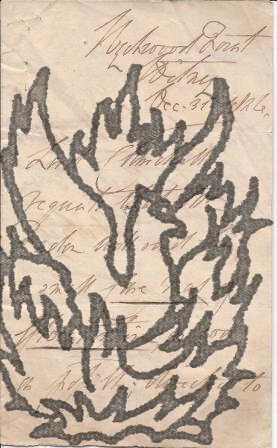 Extensive manuscript list (cartographer's probate inventory? ), in a late eighteenth-century hand, docketed 'Contents of Maps, Charts, &c in the largest Box, from No. 65 to No. 166', including references to maps by John Hamilton Moore. 8vo, 6 pp. Two bifoliums sewn together. On laid paper with Britannia watermark. Text clear and complete. Neatly written out at approximately 38 lines to the page. On aged paper, with slight damage to the first bifolium, the leaves of which are detaching at the spine. Some of the items have been lightly scored through in pencil, but are still legible. The inclusion of such items as '149 Blank Silk Paper for copying Maps' would appear to indicate that the document is an inventory (for probate?) of a cartographer's stock. Last two entries read '165 Blank Sheets of Paper for copying Maps. Forty-eight Autograph Letters Signed, and one Autograph Card Signed (all 'T. 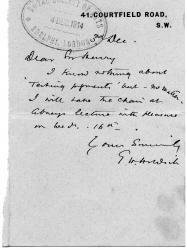 H. Holdich') to Sir Henry Trueman Wood, Secretary, Royal Society of Arts. With two letters written on his behalf and two enclosures. Between 1914 and 1919. All from 41 Courtfield Road, London SW7. The fifty-two items (in various formats) are in very good condition. Texts clear and complete. On lightly-aged paper. A cordial correspondence regarding the business of the Society, Holdich's close association with which is not noted in his entry in the Oxford DNB. On 21 February 1917 Holdich writes to 'accept the honour of appointment to the office of Vice President of the Society of Arts'. 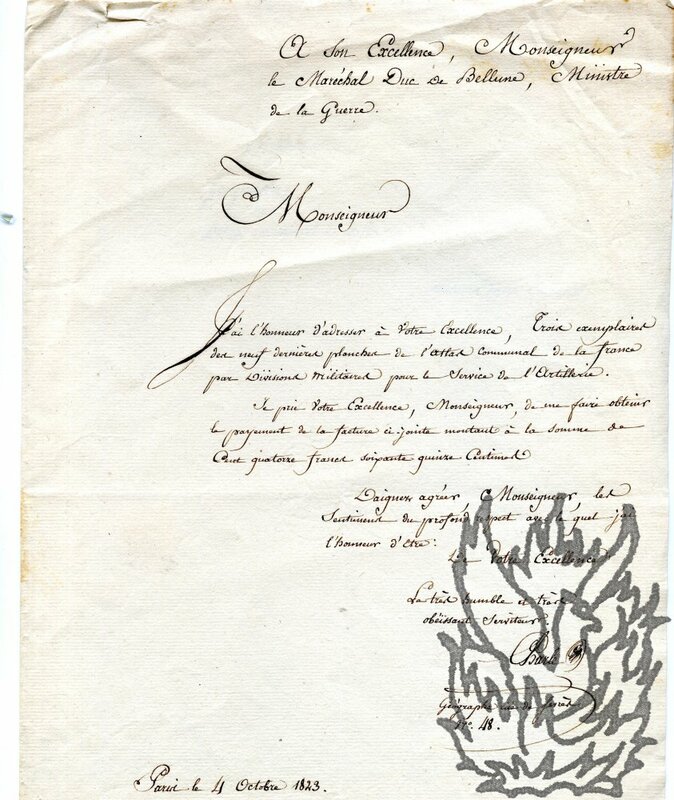 Autograph Letter Signed ('Charle | Geographe rue de Sevres | No. 48. 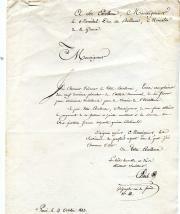 '), in French, to the French Minister of War, 'Monseigneur le Maréchal Duc de Bellune'. One page, on the recto of the second leaf of a bifolium, leaf dimensions 31 x 20 cm. In fair condition on lightly-aged paper with slight wear to extremities. According to his entry in the catalogue of the Bibliothèque Nationale, Charles was a 'Géographe attaché au Dépôt général de la guerre en 1933 [sic], ancien membre de la Société de Géographie. - Dessinateur, il eut une production cartographique très abondante à partir de 1823'. Neatly laid out. London. Published at the Admiralty, 13th. June 1902, under the Superintendence of Rear Admiral Sir W. J. L. Wharton, K.C.B. : F.R.S. : Hydrographer. Sold by J.D. Potter. Agent for the sale of Admiralty Charts, 145 Minories. In light blue, light brown and black on one side of a piece of wove paper roughly 38 x 56 cm. Good: lightly creased and with a little wear at foot. Folded three times. 'Corrections 14th. June' in bottom left-hand corner, and 'Malby & Sons, Lith.' in bottom right-hand corner. Faintly stamped on border at foot 'CHARPENTIER | PORTSMOUTH'. COPAC lists one copy (National Library of Scotland). Fragment of Autograph Letter Signed ('F Beaufort') to his son Sir Francis Lestock Beaufort. 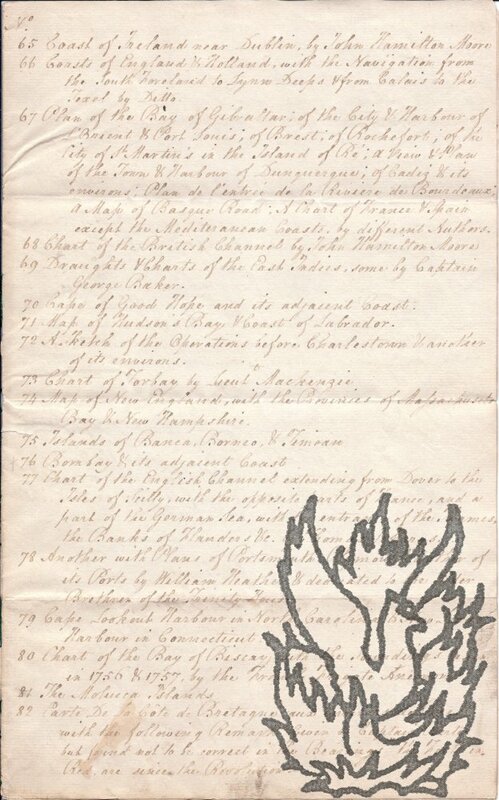 Strip of paper, 3 x 10.5 cm, removed from letter for inclusion in an autograph collection. Good, on lightly-aged light-blue paper. Laid down on strip of cream paper. Reads '<...> believe me dear Lestock | as ever, Yours faithfully | F Beaufort'. Neatly docketed in a contemporary hand in the bottom left-hand corner 'Sir F. Beaufort'. Text on reverse reads '<...> to poor Sneyd I can <...> advice to him, short of <...> filling the plan he had <...> and getting him (at <...>'. Early Kent Maps. (Sixteenth century). [1937;] 'Reprinted from "Archaeologia Cantiana," Vol. XLIX. Printed by Headley Brothers, Ashford, Kent. Offprint of pp.247-77. Small 8vo. 4 plates, 3 of them folding. Foxed, loose copy with closed tear and crease to first leaf. In original light-brown printed wraps, which have become detached.. 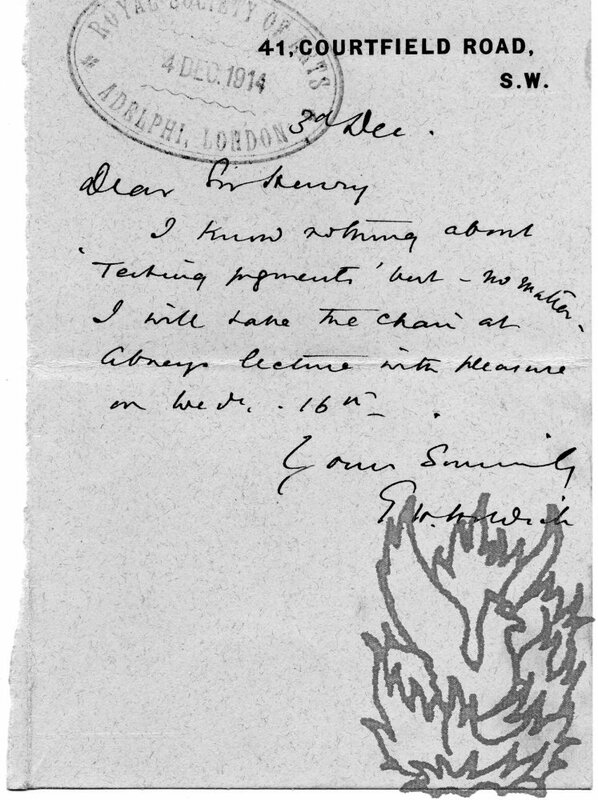 Presentation copy, with inscription to 'Mr. Edward Lynam from the writer' on front wrap. Manuscript annotation in pencil, presumably by Lynam.